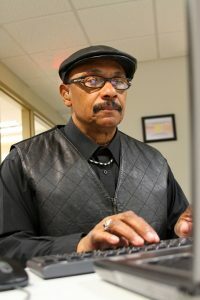 Hi, my name is Art, and I’m a student here at Literacy Services. This is my story. Many years ago, I was in a six-month alcohol and drug program at Matt Talbot Recovery Services. One guy there was going to Literacy Services. He asked me if I wanted to go with him and enroll there. I thought about my mother and how she had gone there to learn to read, so I thought I’d try it, too. When I got there, the tutors were very encouraging to me. 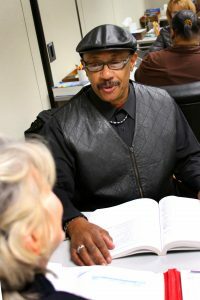 I completed a program at Literacy Services and then I tried MATC. When I got there they were moving so fast that I couldn’t keep up. There were no tutors there to help me like at Literacy Services. I stopped going there because I did not find the support I needed. Twenty-four years later, in 2013, I decided to go back to Literacy Services and get some computer skills. They had computer classes to get me started. I had a tutor, MaryAnn, who showed me how to find information on the computer. I was so amazed with what you can do with a computer! She helped me look up Betsy Smith, a singer that I wanted to know more about. I wanted to learn more. The door was open. Learning how to use the computer gave me help with Bible study at church. I wrote a paper on the meaning of the Fruits of the Spirit. Now I could read and share what I found on the computer with my group. I was not alienated any more. I was also having problems with my hearing because I am going deaf. My other tutor, Debbie, found a small business that helps people who can’t afford to buy hearing aids. That was a big help to me. Now I can hear people talking to me. Debbie also helped me get a used laptop from her daughter-in-law. Now I have some computer skills and a computer. I am a man on a mission! I wrote a script on black history for my church. I found everything I needed on the computer myself. I found songs, poems and information on what to include in the introduction. I wrote the entire program. My presentation inspired three more presentations so that the whole month of February was dedicated to black history. At Literacy Services, the staff and tutors tried to get me to read more. Finally I agreed to read The Jackie Robinson Story. It was the first book I’d ever read. He was a fighter. I learned that by focusing on your goals and dreams, you can still accomplish what you want in life, like Jackie did. I also completed the Pre-GED program. That wasn’t easy for me to do. I had a storm that came into my life. My kids’ mother died all of sudden and I couldn’t concentrate and focus Before the funeral, I wrote her eulogy. By coming to Literacy Services, I found the courage to write and deliver the eulogy to over 300 people at the funeral. I had written things before, but many times my writing was like when a clown juggles—the words were all over the place. But at Literacy Services my writing gained discipline, consistency, and organization. Because of this distraction, however, I couldn’t pass the Pre-GED test that I needed to. I failed three times, but MaryAnn kept saying to me, “You can pass the test.” Kelly Fox knew what areas I needed to work on to pass, and that’s what she assigned me to do. So I gave it one more try. The next time I passed the test. Kelly and my tutors were there for me all the way. I have also started a small business. Graduating from the Pre-GED program has given me the confidence and the courage to go out into the world and be my own man. My business has given me independence and has also helped my family. Right now, I’m working on writing my family’s history to leave to my kids, grandkids and future generations. I’m taking all the oral history and writing it down so it won’t be lost. This is important for my family’s health and knowledge of their history. In closing, I just want to thank everyone, tutors and staff, for your time, patience and caring for people. You’re reaching out to people from all walks of life who are looking for a little help trying to make their lives better. I have told others that they could benefit by coming here. May God bless Literacy Services.